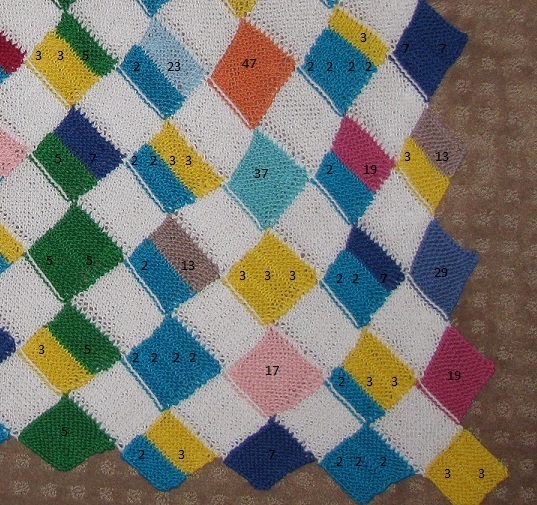 On Wednesday, I finished knitting a Prime Factorization Blanket for my new little niece. 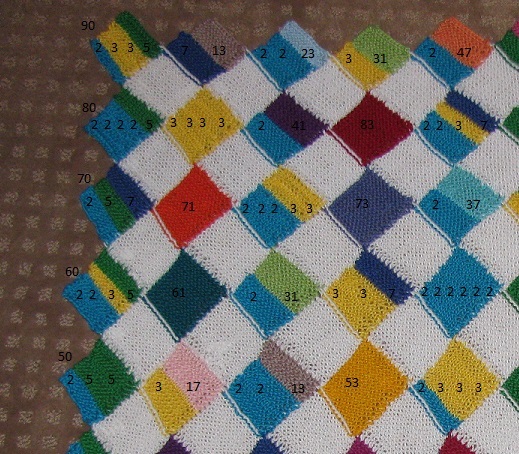 In my post about the blanket, I explained how the colors show the prime factorization of each number from 2 to 99. But I didn’t talk about the patterns, and I want to say a little bit about that here. In fact, the only reason the Prime Factorization Blanket isn’t quite as good as the Prime Factorization Sweater is that I can’t have rows of 8 on the back and rows of 2 and 3 on the sleeves. And the Prime Factorization Scarf is good for getting the flow of the numbers. Let’s start by looking at the diagonals. 11 is 1 bigger than the base of 10. So the color for 11, red, goes in a diagonal across the blanket from the bottom left to the top right. 9 is 1 less than the base of 10. 9 = 3 x 3, so every number with a factor of 9 has two sections of yellow, the color for 3. 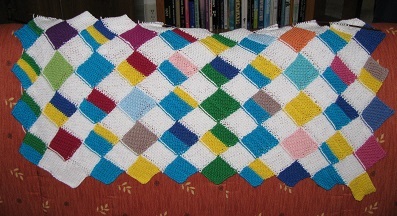 You can see the yellows going diagonally up the blanket from the bottom right to the top left. Oh, and I nearly forgot the more obvious ones. Since 2 and 5 are multiples of 10, they line up in columns. Every second column has turquoise for 2, and every fifth has green for 5. 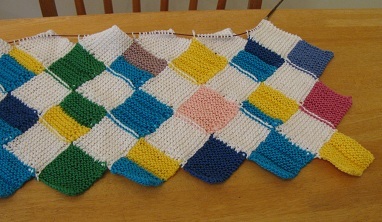 Once you’re used to focusing on one color, you can pick any color and watch how it distributes evenly around the blanket. Take 19 for example, dark pink. You can see it climb up the blanket from the bottom right to the top left on a steeper diagonal than the one for 9. And if you look at the colors it’s paired with, first it matches with 2, then with 3, then with two sets of 2, then with 5. Another fun pattern is that the columns are sets of numbers that are congruent mod 10. So if you add, subtract, multiply or divide any two numbers in the same columns, your result will be in the same column. For example, 2 + 17 = 19. Well, 62 + 27 = 99. The numbers in the second equation are from the same columns as the numbers in the first equation. And that’s only the beginning of the patterns you can find. Now that I’ve mailed off the blanket, I’m consoling myself by getting excited about the Pascal’s Triangle Shawl I’m going to make. Pascal’s Triangle is formed by starting with 1, then adding a row of numbers where each number below is the sum of the two numbers above it. The cool thing? Even though you’ve got really big numbers, when you factor them, the only prime factors are ones that have already appeared in the triangle. So I only need colors for the prime factors 2, 3, 5, 7, 11, and 13. I’m stopping at row 15, because on row 16, we’ve got numbers with more than 6 prime factors, and that’s the most I’m prepared to accommodate unless I make my diamonds bigger. But up to 15 is going to be lovely. I chose colors yesterday and tried to order the same colors. I’m not sure the ones I have aren’t discontinued colors by now, but when my order arrives, I can get going. (In fact, I’ve already started with the colors I have, hoping I won’t have to take out too much.) 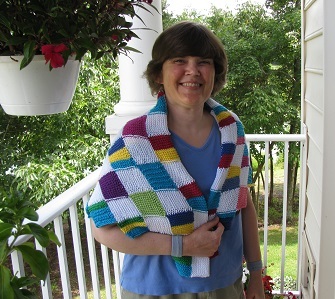 Here’s the color scheme I chose, using Cotton Classic yarn by Tahki. 2 is on the bottom left, and then it goes around counterclockwise. 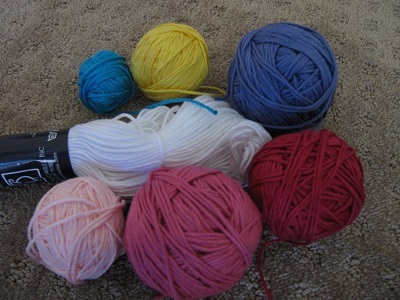 So 2 will be pale pink, 3 will be rose, 5 will be red, 7 will be purple, 11 will be yellow, and 13 will be turquoise. And they are going to repeat in beautiful ways, just you wait! I’ve already begun, though if it turns out that the pink I’ve ordered is a different shade from what I have, I’ll have to take out the square for 2 that I’ve begun. But I can’t stand waiting for the order! You can see there the initial diamond for the first row: 1. 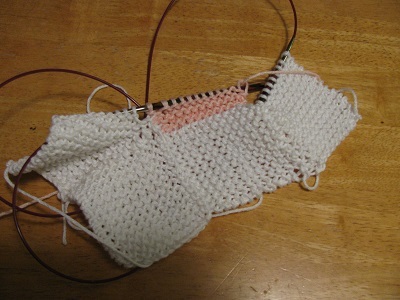 Third row, I’ve knitted the first diamond for 1, and I’ve begun the next diamond, for 2. When I get to the row with 4, I will start showing the prime factorization, so 4 will be listed as 2 x 2, with two sections of pink. The way I’ll show the prime factorization will be exactly like the blanket, but the patterns will be very different, always with the diamond representing the sum of the two numbers on its lower edges. I can’t wait to show pictures of the final result. I think it will be beautiful! Halfway on the Prime Factorization Blanket! 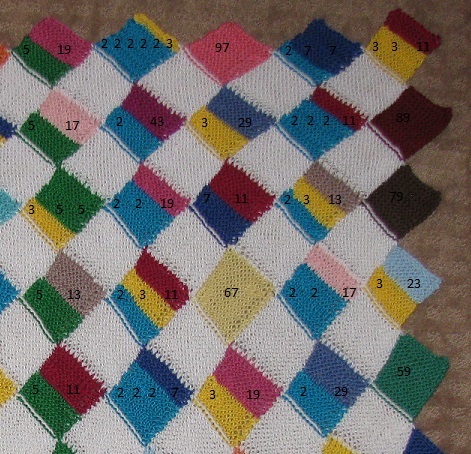 I’m halfway finished with my new niece’s Prime Factorization Blanket! That’s the good news. The bad news is that it doesn’t look like I’m going to finish before Arianna arrives. But the good thing about a blanket is that it doesn’t have a size, right? (Those who need to be brought up to speed, I explain the blanket in previous Prime Factorization posts.) 40 should be 2 x 2 x 2 x 5, so the square was divided into four sections, with three of them the color for 2 (blue), and one the color for 5 (green). But, horror of horrors, I had used the color for 3 (yellow)! 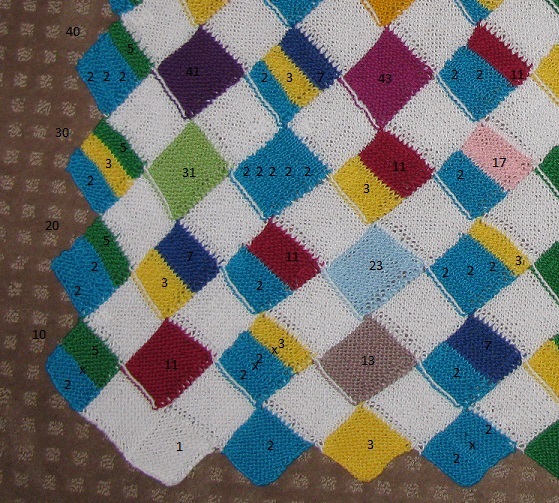 And I didn’t even discover it until I after I had knitted 50 = 2 x 5 x 5, also using yellow when I should have been using green! Yikes! But then I was getting ready to start on 51 = 3 x 17, and then it dawned on me that the color for 3 is yellow, so it is NOT the color for 5, and I’d been doing it wrong! Fortunately, it was on the end of the row, and relatively easy to fix. I took out the knitting I’d done on 50, undid the last white square in the row, and then undid just the yellow section I’d put on the top of 40. 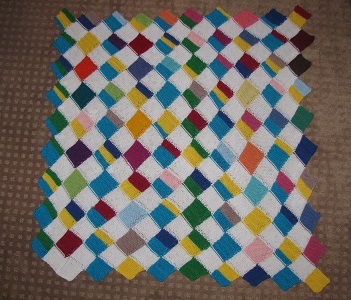 I replaced it with green, knitted the white square back, and then started up on 50. But I’ve decided that taking a picture after each row and *checking* the numbers carefully is a good idea! I did discover a mistake when I finished knitting my prime factorization sweater. I think it was in the rectangle for 48. But 48 has five factors, and in that piece of knitting the factor for three only was about four stitches. So I was able to pick them out and put in the correct color with a crochet hook! It would not be so easy to do on this blanket, so I am going to have to be more vigilant! Librarians Help – With Math! Today I had my Colors and Codes program that I mentioned last week. Now, I spent ten years of my life teaching college math, but doing math programs at the library is so much more fun! Why? Well, the biggie is I don’t have to grade them, so it makes the whole thing much more light-hearted. I’m showing them things about math that I think are really cool, and they get to think about ways to do it themselves. And it’s all just for fun. At the library, we teach people things they want to know! If they don’t want to know them, they don’t need to come. It’s that simple! Here’s what I did. I showed the kids my prime factorization sweater (wore it of course), and we worked out how it works. (That was fun!) I told them if colors can represent numbers, they can also represent letters. Just use 1 to 26 for A to Z. So you can write messages this way. I showed them a prime factorization code, then showed them other bases and how you can make codes with them. 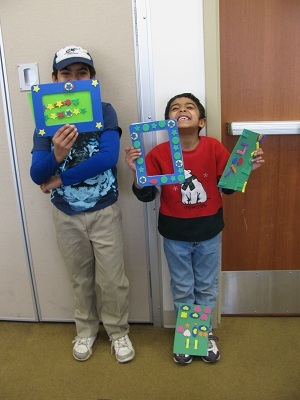 We wrapped it up by getting out sticky foam shapes and they could put a coded message or just a pretty pattern around a picture frame or on a bookmark or a door hanger. The highlight for me, I think, was when a girl was working on coloring in the prime factorization chart on the hand-out. She was stuck on 24. I asked her what it equaled, and she said 12 x 2. So we looked at 12, and then the light went on and we talked about how you could do figure it out different ways, but you always got three 2s and one 3. Now, I’m going to write some notes to myself while the program’s fresh in my mind. It went well; the kids had fun. But I want to do it again this summer, and hope it will go even better. 1. I’ll set the age level higher. I do think I lost a few kids this time. I think I’ll set it at 10 or 11 years old rather than 8. You want the kids to be fully comfortable with multiplying. Now that I think about it, when I did this program a few years ago at Herndon Fortnightly Library, I think the age limit was 10. 2. We’ll do some coloring on the prime factorization chart before I move on. This group did work out with me how it works. I didn’t want to get bogged down, but I think some coloring would help them understand it better. 3. I’ll have them figure out the numbers for their name in every code I go over. For example, my name, Sondy, in a base 10 code is 1915140425. (S is the 19th letter, O is the 15th, and so on.) In a prime factorization code, it’s 19 1 3 5 1 2 7 1 2 2 1 5 5 1. (19 x 1, 3 x 5 x 1, 2 x 7 x 1, 2 x 2 x 1, 5 x 5 x 1) In a Base 6 code, it’s 3123220441. In a Base 5 code, it’s 34 30 24 4 100. In Binary, it’s 10011 1111 1110 100 11001. Taking the time to do that would mean they’d get what I was having them do when they went to use the foam sticky pieces. 4. We’d do some coloring on the other charts before we moved to the foam shapes. Then I’d have them do their name with the colors they picked. 5. I’d show them exactly how I did my name on the bookmarks, one using colors and one using shapes. Did I mention everyone did have a good time? But I think I’ll do a little more hands-on, using their names, before I move to the craft next time. But it was a great trial run! And don’t forget! Librarians help! We get to show kids how much FUN Math is! And we don’t even have to test them on it! I just got a tweet that made me prouder than I’ve EVER been of my Prime Factorization Sweater, and that’s saying a lot. Here’s the picture that accompanied it. Even by the backs of their heads, you can tell those are engaged kids! Yes! That’s what it’s about! Mr. MacFarlane, you made my day! And the timing is lovely. Next week, at my own City of Fairfax Regional Library, I’m doing a program I’m calling “Colors and Codes” where we’re going to do exactly that. I’ll wear the sweater (or maybe my prime factorization t-shirt and bring the sweater. And the scarf). I’ll show them how we can assign each letter of the alphabet a number from 1 to 26. We’ll start with a factorization code, but move on to things like Base 6 or Binary. And I’m going to have foam shapes for them to make crafts with codes in colors or shapes. Yay! See, we don’t have to make Math fun! Math is fun! I’ve already posted several times about my Prime Factorization Knitting, and I can’t resist posting pictures every time I get another row of numbers done on my new niece’s Prime Factorization Blanket. And here’s a close-up on each side, with the numbers written in. You’ll have to figure out the factors. And I can assure you that it’s a lot easier to tell when there are two or three (or four or five) of the same factors in one number when you can see and feel the blanket. I divided it with garter ridges, and the photo couldn’t really catch that. Don’t forget that you can get your very own Prime Factorization T-shirt at my Cafe Press shop for a lot less effort than this blanket is taking (but okay, you won’t have as much fun as I’m having). I took it to a Youth Services Librarian meeting today, and only the unwary asked what it was going to be. I must admit, it’s a lot better for knitting during meetings when I’m on one of the white rows. Will I finish before Baby’s arrival in May? I hope I will at least be close…. 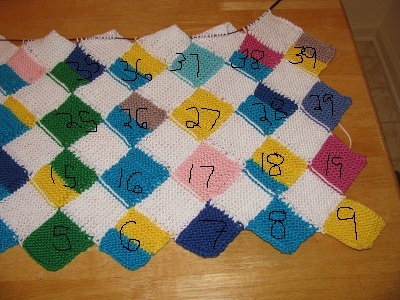 I got done another row of numbers on the Prime Factorization Blanket for my arriving niece! The bottom row in the picture is 1 (white), 2 (blue), 3 (yellow), 4 = 2 x 2, 5 (green). The second row is 10 = 2 x 5, 11 (red), 12 = 2 x 2 x 3, 13 (tan), 14 = 2 x 7, 15 = 3 x 5. The top row is 20 = 2 x 2 x 5, 21 = 3 x 7, 22 = 2 x 11, 23 (baby blue), 24 = 2 x 2 x 2 x 3, 25 = 5 x 5. The second row is 15 = 3 x 5, 16 = 2 x 2 x 2 x 2, 17 (pink), 18 = 2 x 3 x 3, 19 (dark pink). I really like the way it’s turning out! 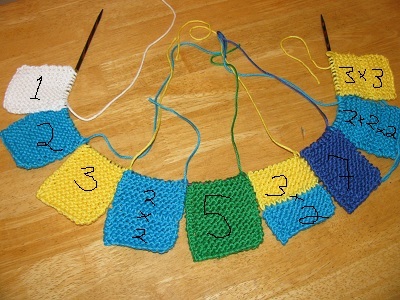 You can read more about my prime factorization knitting in previous blog posts or via my Pinterest board. And don’t forget to look in my cafe press shop for prime factorization t-shirts. I’m so excited! Today, thanks to a note in the ALSC (Association for Library Service to Children) newsletter, I found out about Bedtime Math. Why do I think Bedtime Math is so awesome? Because that’s totally what I did with my younger son. My first Master’s degree was in Math, and I was a college math instructor for ten years. College students in general ed math classes are generally not excited about math. So when we started doing math problems with my excited son at bedtime — I’m not sure how it started — my son quickly learned those magic words I absolutely COULD NOT resist — “Just one more math problem, Mommy, please!” He could extend bedtime forever with those magic words. One week later, his brother asked him a problem I never would have tried: “What’s 16 times 4?” Timmy (the 5-year-old) figured it out *in his head. * Without knowing times tables. So that was the context of “One more math problem, Mommy, please.” I’d give him progressively harder addition problems — and then it got to be progressively harder multiplication problems. All done in his head, at bedtime. For fun. Of course, it all starts with counting. I remember with my older son, just counting as high as he could go in the car while running errands. It’s fun when they really realize how it works and that they could go on and on forever. He was also the one who kept making up words for “numbers bigger than infinity.” I couldn’t quite convince him that didn’t work. In my current job as a librarian, I was thinking about all the counting and math we did when my kids were small. And then thinking about the Every Child Ready to Read workshops, where we encourage parents to read, talk, write, sing, and play with their kids. I’m going to do the workshop “Fun With Science and Math for Parents and Children” — only I think I’m going to take out the Science and just focus on Math. See, the thing is, I don’t believe for a second you have to “make” Math fun. I think math *IS* fun, and children naturally think so, too. Can I communicate that to parents? 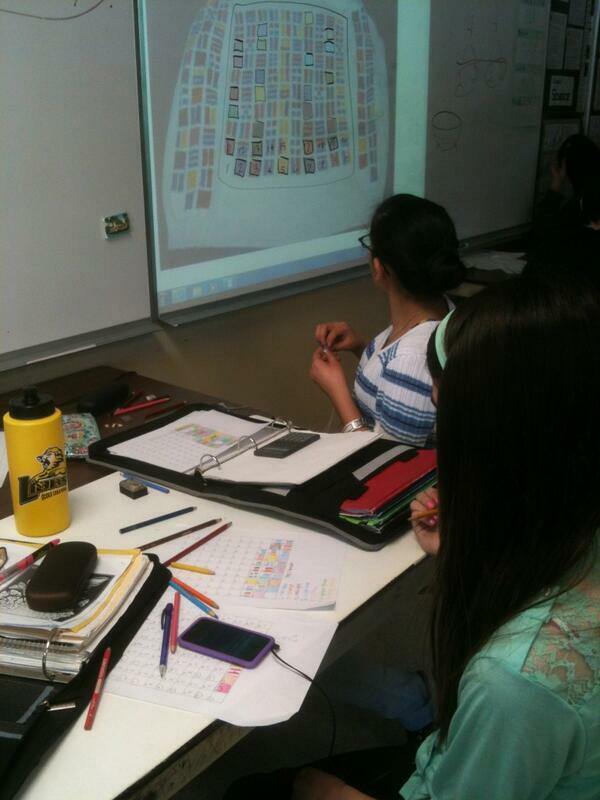 I’m also planning to do a program with older kids about using math to make coded messages with colors or shapes. It uses ideas from my Prime Factorization Sweater and my Coded Blessing Blanket. I did the program a few years ago, a little afraid I’d lose the kids, and they totally loved it. I still say, as a librarian, part of my job is the FUN side of learning. At libraries, we help people find information to teach themselves. But in the children’s department, a huge part of our job is helping parents make learning a natural and fun part of their family life. We don’t have to test them! We don’t have to follow the book or the curriculum! We can show them ways to think about the concepts that are just plain fun! 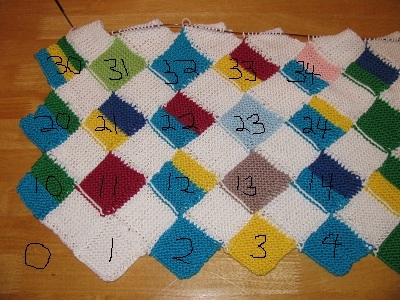 So, Tuesday I posted my plan for making a Prime Factorization Blanket for my new niece or nephew. I then learned that my brother and his wife may know the baby’s gender by December 17th. Did I want to wait that long to choose the colors and start? Short answer: No. 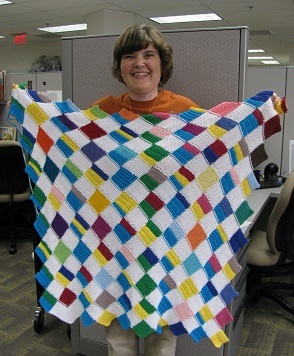 I got to thinking: It’s not like this won’t be a very multi-colored blanket. I had thought about using shades of blue or shades of pink at the beginning, but I don’t think that’s a good plan. Since the colors represent numbers, and since a baby’s going to see this, better to have distinct colors with distinct names as the prime factors that show up most often. On top of that, I happen to have a full skein and more of a turquoise blue left over from another project. Turquoise worked out very well as the color for 2 in my prime factorization scarf. It doesn’t cry out “boy,” but neither is it a bad color for a girl. And best of all, it goes well with pretty much every other color. (And 2 has to do that.) I decided to go with bright, rich colors for the primes that will be most predominant. Thanks to a fairly long management meeting and a day off today where I needed to read, I’ve already finished the first row. I’m very happy with the colors! 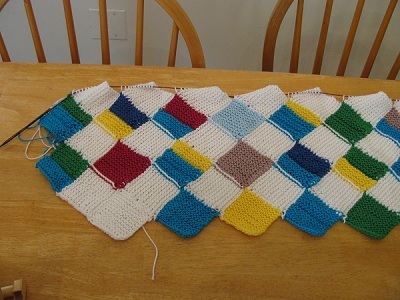 Now, the first row consists of just knitting 9 squares. The next row of white will convert them into diamonds. I’m also proud to say that I sewed in the starting ends of all the yarn. And that’s my plan to go on with: At the end of each row, I’ll sew in all the ends that were loose at the start of that row. (I don’t want to sew in the ends right next to a live stitch.) 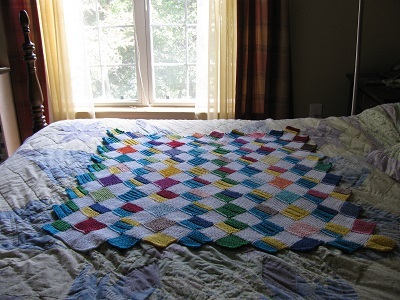 That way, it won’t be a daunting task at the end of the blanket. I admit it’s getting where I’m going to have a hard time giving this away! Good thing I’ve publicly said it’s for my new niece or nephew! You are currently browsing the archives for the Prime Factorization category.